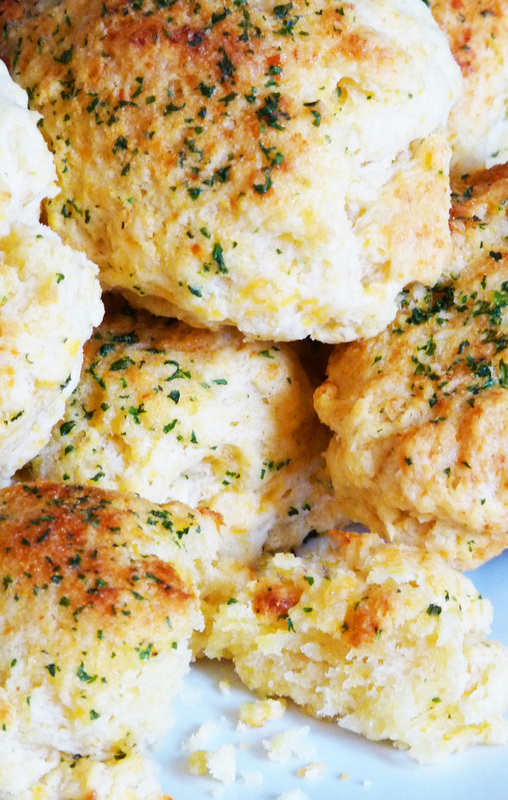 My American friends will recognize the following 5 words as some of the most beautiful in the English language: Red Lobster Cheddar Bay Biscuits. Yes, this is the recipe for THOSE cheddar biscuits. These really are as delicious as the Red Lobster original, and are some of the easiest biscuits I’ve ever had the pleasure of making. My lovely best friend Erin has insinuated on several occasions that my recipes are just too complex for the novice cook, but these really couldn’t be more simple to put together (or more difficult to stop eating!). 1. Preheat oven to 400 degrees Fahrenheit/200 degrees Celsius. 2. Combine Bisquick with cheddar cheese, milk, 3 tablespoons melted butter, and 1/8 teaspoon garlic powder in a medium bowl. Mix until thoroughly combined. 3. Drop approximately 1/4-cup-sized portions of dough onto an ungreased baking sheet. Bake for 14 to 16 minutes or until the tops of biscuits are lightly browned. 4. While baking, combine topping ingredients in a small bowl. As soon as biscuits are browned, remove from oven and immediately brush with topping mixture. Serve warm.